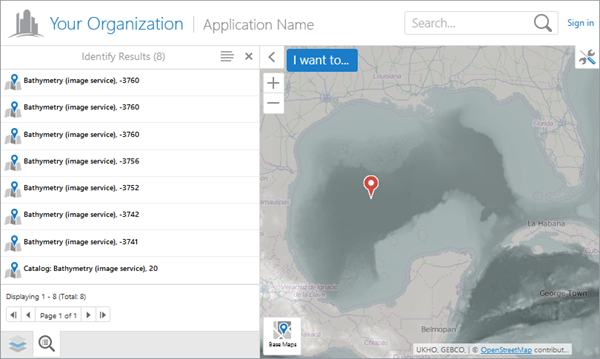 Geocortex Essentials and the HTML5 Viewer support identify operations on ArcGIS Server image services. At a minimum, identify operations return the value of the raster cell that is being identified. You can configure identify operations to also return the catalog information and, if the image service has a mosaic dataset, the dataset's individual values. The screen capture above shows identify results on a bathymetry (water depth) image service that has a mosaic dataset. The topmost result is the result after the mosaic function is applied. The individual values that were used to calculate the mosaic function are next in the list. The catalog is the last result in the list. The pushpin marks the identified location, which is the location of the dataset values and function result. There is a second pushpin outside the current extent, which marks the catalog. By default, users can identify by point only. If the user performs some other type of identify, such as a polygon identify, no results are returned from the image service. You can configure an HTML5 viewer to return image service results for line-based and polygon-based identify operations. The viewer's Identify Module has a property called restrictRasterIdentifyToPoint that controls this. Performing identify operations on image services is disabled by default. Image services have an Identify Settings tab where you enable identify operations and configure any additional types of result that you want to show. Allow Identify Operations: If you want end users to be able to perform identify operations on the image service, select the checkbox. By default, users cannot perform identify operations on image services. Include Mosaic Dataset Values: If you want identify results to list the mosaic dataset's individual values, in addition to the mosaic function's result, select the checkbox. For this setting to work, Allow Identify Operations must be selected. The Include Mosaic Dataset Values setting only appears on the Identify Settings tab when the image service has a mosaic dataset. Include Catalog Items: If you want identify results to list the catalog, select the checkbox. Users will be able to click the catalog item in the results list to show the catalog's properties and highlight the catalog on the map. For this setting to work, Allow Identify Operations must be selected. Click the Identify Settings tab.